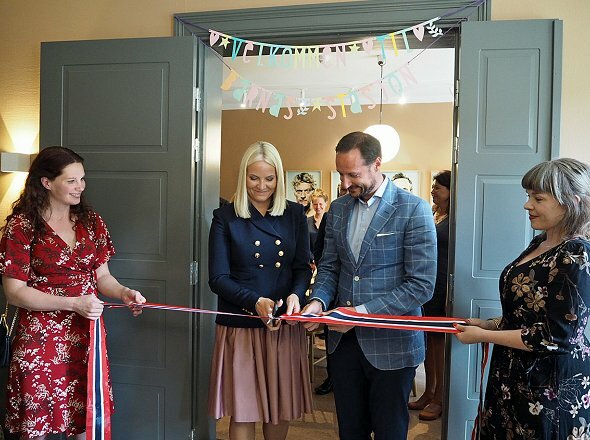 Oh my, it looks like Mette Marit and Haakon both got dressed in the dark this morning. Rinie, nothing is matching as most of their fashionable appearances do. (Except with Sportswear or traditional Norwegian costumes) All clothes are mostly to tight, to short, to small, but I am sure: expensive names. They look like they have both outgrown their jackets. Also, Haakon´s shoes seem to be favourites of his but I wish he would retire them as they look rather scruffy. I like the red floral dress on the lady in the first photo. 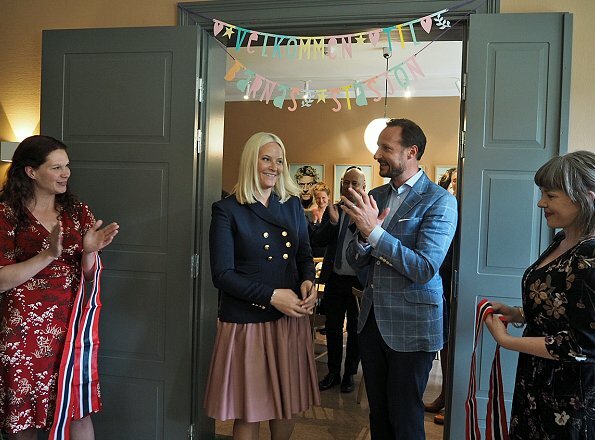 I think that it would look good on Mette-Marit as a flatters her body-type, especially a fuller bosom. Oh, the juxtaposition of the Crown Prince couple under the photos on the wall behind them (picture #4) is so funny! Their faces should also be up there! As to their clothing selections, I am coming to realize that they probably do not feel comfortable looking "swell." Is it a reflection of the Norwegian society which seems more uniformly mostly one "class?" Just a thought. The bulky jacket with the pleated skirt makes MM look shapeless. Haakon's jacket is ugly and too tight. Who has worn a check sports jacket since the 70s? Esta pareja son tal para cual, desaliñados y embutidos en ropa 2 tallas más pequeña que la suya. Paletos. Crown Princess Mette-Merit looked so old here. Her outfit doesn't work together. Her husband looks young and vibrant in his suit though. 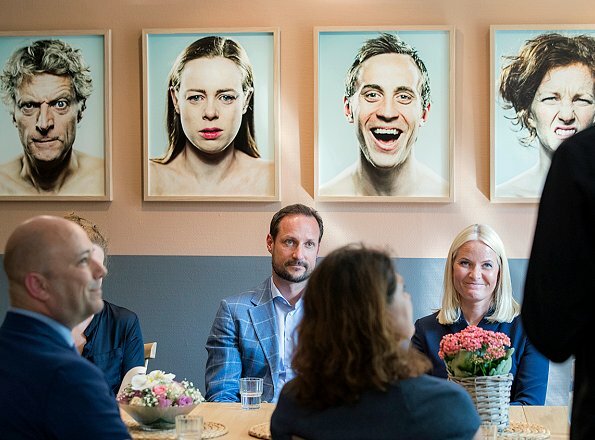 Those crazy photos behind their backs/on the wall: Is this good idea on a place for vulnerable children and their parents??? I have the impression that Norway changed a lot. I know, this is not about fashion, and neither is the couple's appearance today.